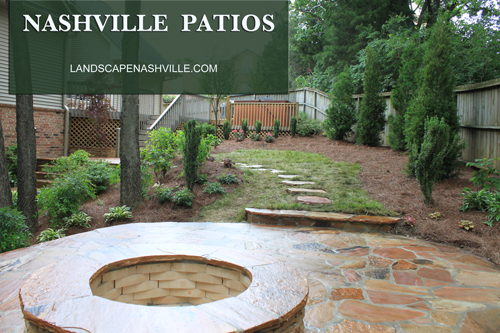 The photos posted here are from a Nashville client that requested an all organic approach to the installation of the design we created for them. 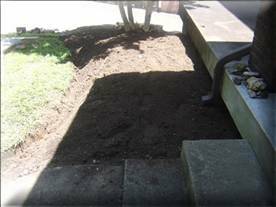 The soil that was added to the beds was a leaf compost / soil mix. We also added 7 bags of all organic compost to the beds which was tilled in. 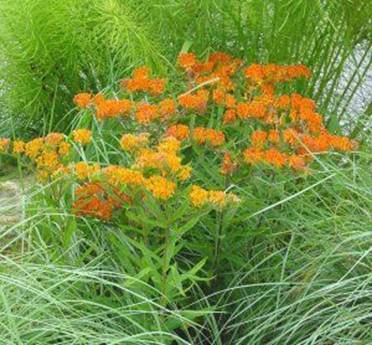 plants that are also drought tolerant. 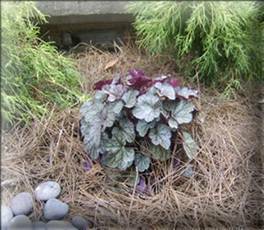 The Coral Bells ( Heuchera Silver Scrolls ) ties the whole landscape together. 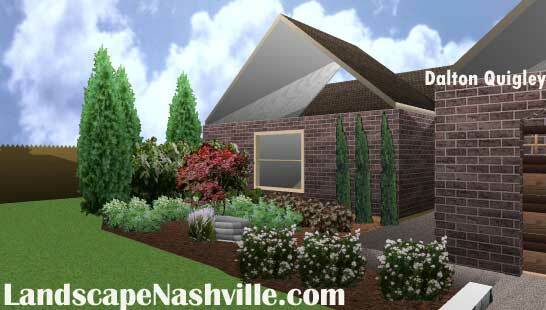 With Hosta and Hydrangea for shade, the light requirements were taken into account for all plantings. Most modern landscape plants are acidic. 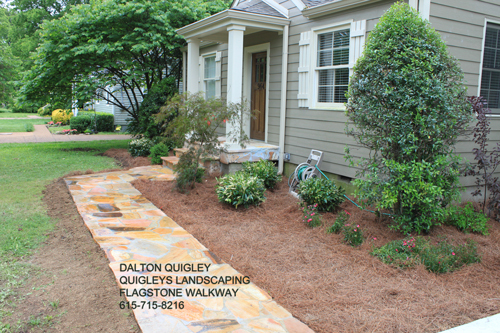 We also used Pinestraw Mulch because it breaks down acidic while aerating the soil with organic matter. 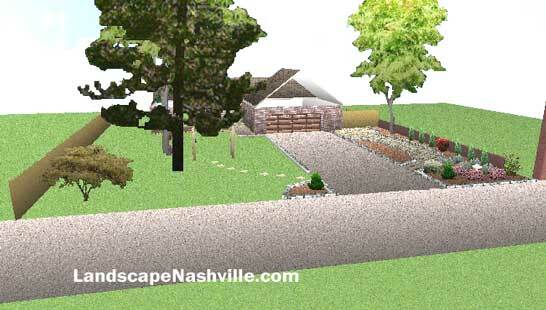 We want to do your all organic curb appeal landscaping in the Nashville Middle Tn area. 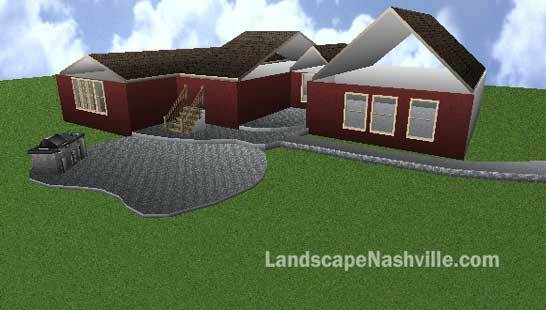 This was a fantastic project we completed several years ago in Murfreesboro Tennessee. 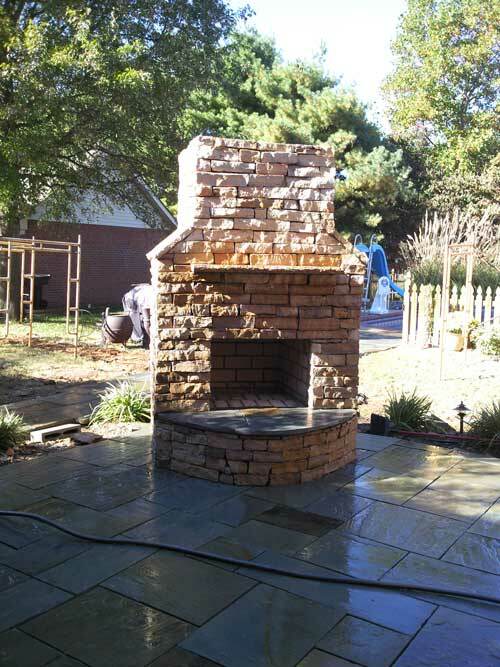 In a back yard that leads to a pool area we were hired to make a Pennsylvania flagstone patio / walkway, and natural stone rubble stack fireplace. 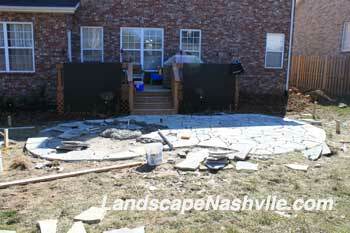 The first image is of the completed job and the rest of the photos show the job in progress. 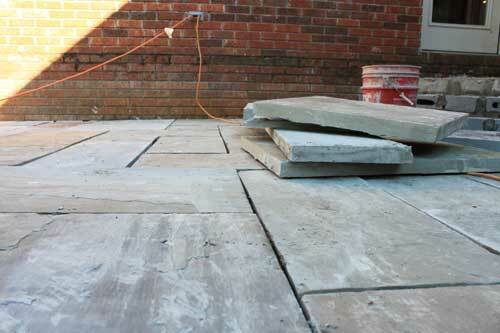 Next to make the benches, grout and clean and seal the patio/walkway. 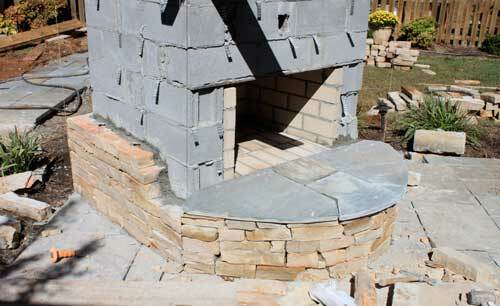 The next few images are showing the project as it was in progress. 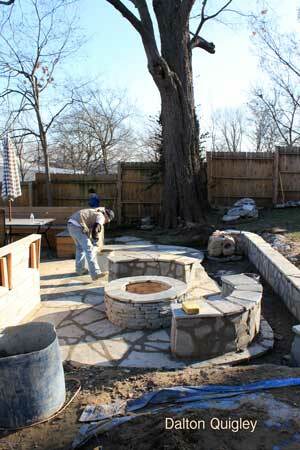 Pennsylvania stone patio and fireplace photos of job in progress. 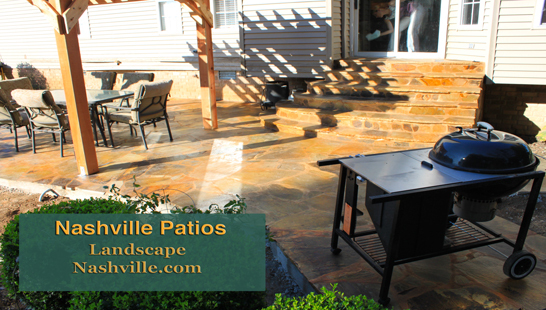 Pennsylvania stone goes by Pennsylvania Flagstone, or this patio could be called a Pennsylvania Ashlar Pattern Patio. 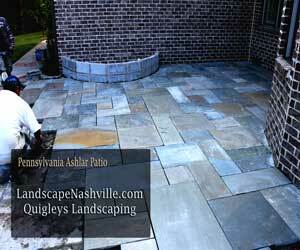 Ashlar is the pattern the stone is laid out in and you know it is Pennsylvania because when you stand back there is a bluey green color on the overall surface. 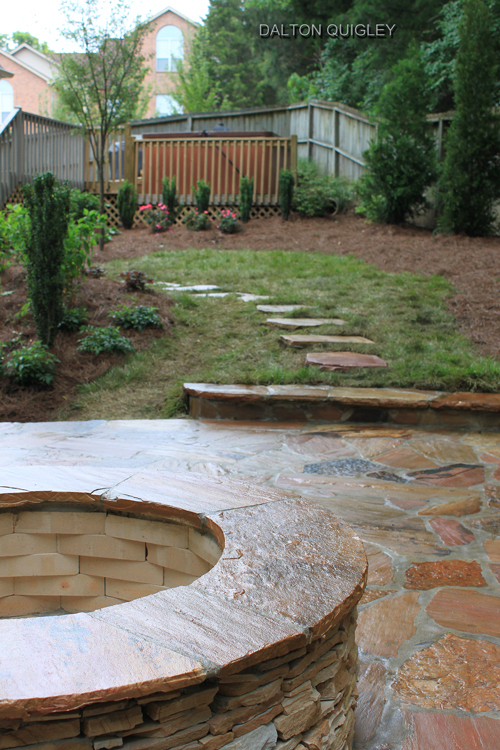 The clean lines and natural patterns of the stone make it a fantastic contrast between natural stone’s organic patterns and clean diamond cut straight lines. 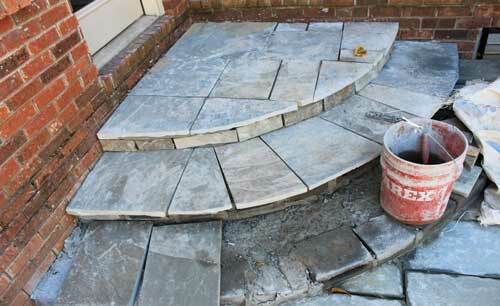 Much like how a granite counter top has that play of organic patterns but being man made with straight lines. 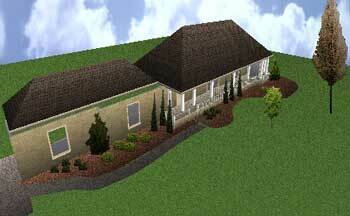 Thank you for looking at one of my projects. 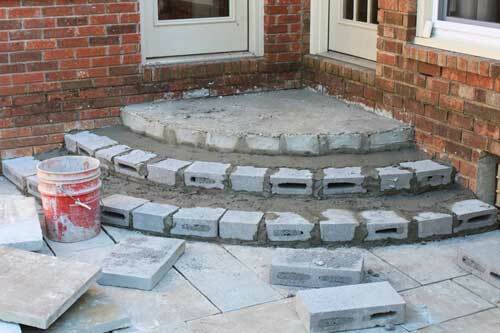 I hope you learned something about Pennsylvania stone and would even consider using it on your property. 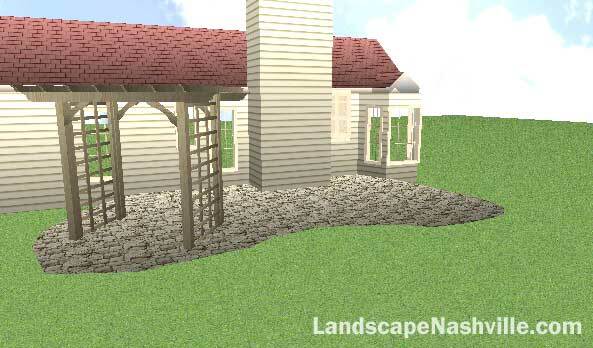 The below image is a different Pennsylvania stone project image. 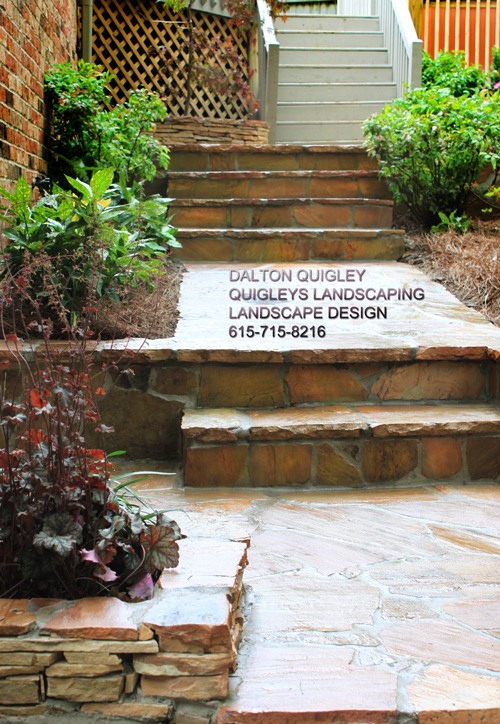 Please call me if you have any questions in the Nashville, Murfreesboro, Brentwood, Franklin, Spring Hill, and Nolensville TN areas. 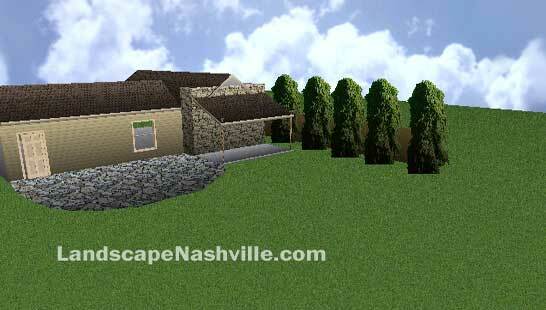 This project is for a client in Smyrna Tn. 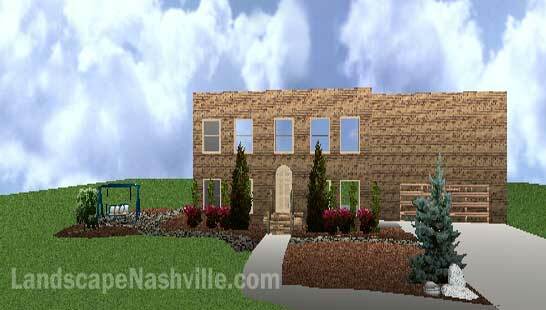 The first image is just the home. 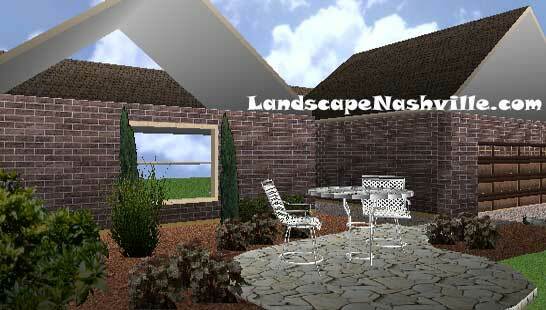 In this next image we have added a flagstone walkway and small patio for under the swing. 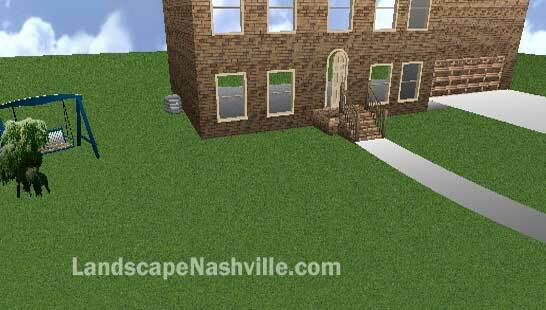 In this last image we are suggesting taking the grass area that is between the walkway and driveway and converting it to beds. 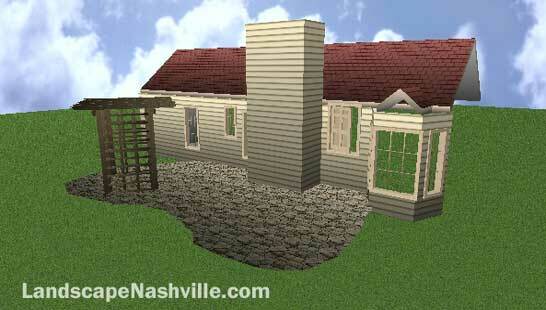 This would be a more modern look. 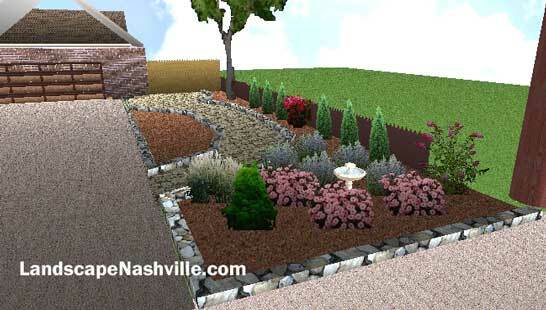 More images to follow of this Smyrna Tn Landscape Design October 2011. 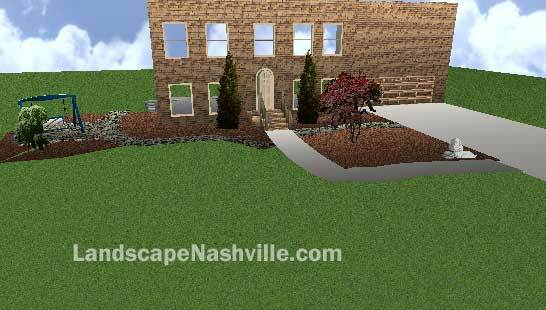 Below I have added some evergreens under the windows with knockout roses along with a Blue spruce near the driveway. 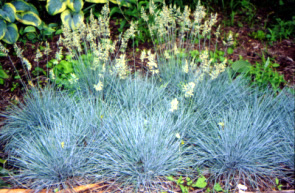 Lets talk about these plants and the e-mail I sent you. 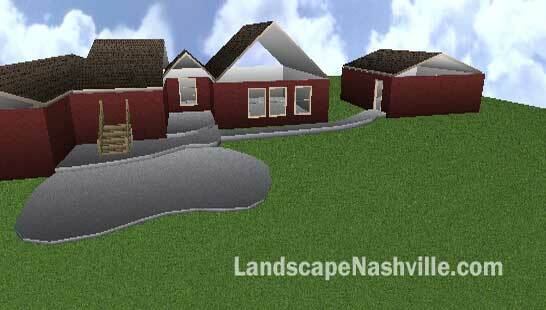 I started with a rough concept of the buildings with the view of the back yard. 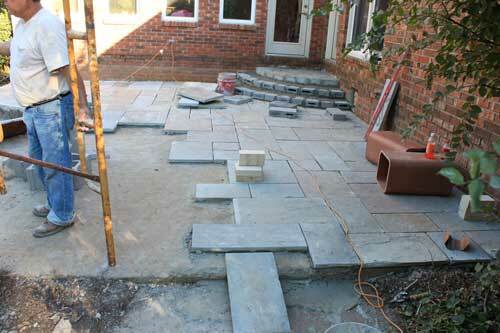 The next image shows the 3 levels of the new patio area and walkway without any texture. 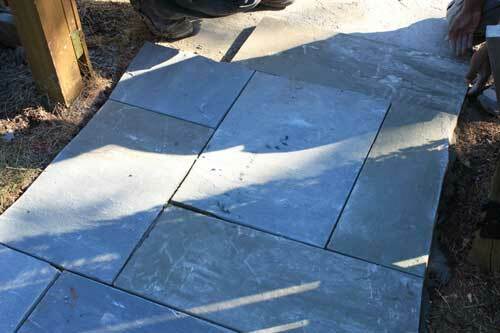 The third image below shows the patio surface with some texture similar to the stone we are talking with you about. 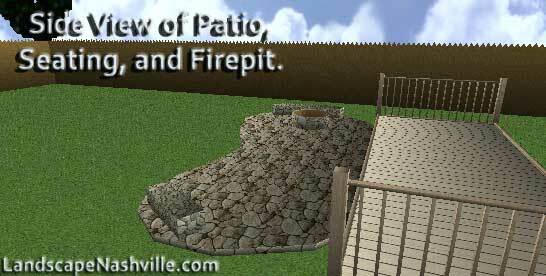 The fourth image has the grill where we discussed. 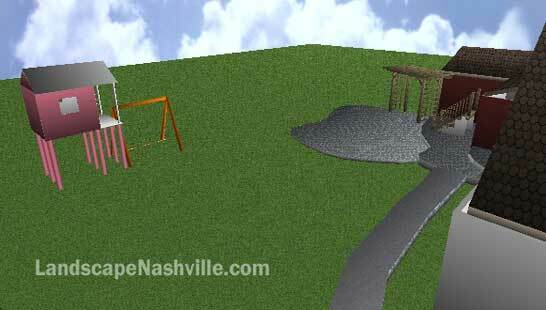 And lastly the 5th image shows an arbor example for putting a swing to watch the children play in the play area. This next example is more rounded. 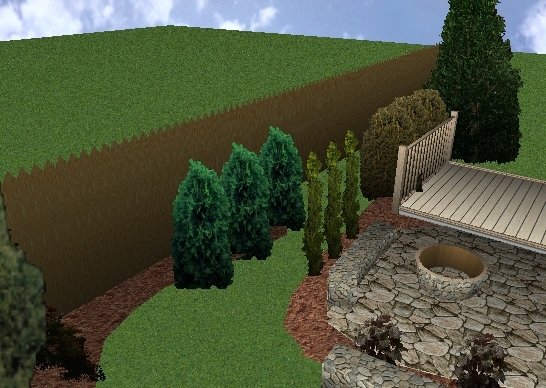 This images shows a privacy fence with some evergreen columnar plants. 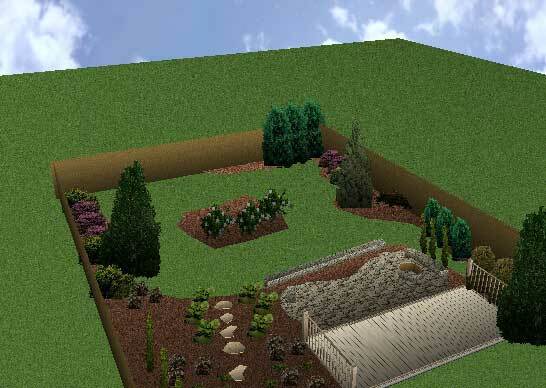 The plants we want to use are not in my image library but this should give you some idea of the concept. 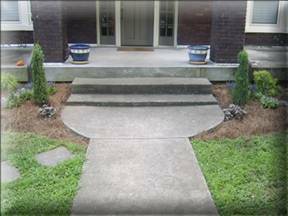 The steps are not represented. 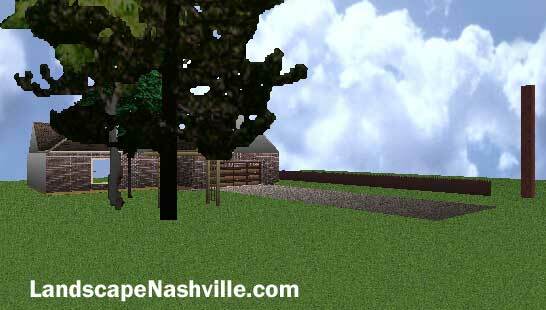 I added a simple tree on the left which would be a Coral Bark Japanese Maple. 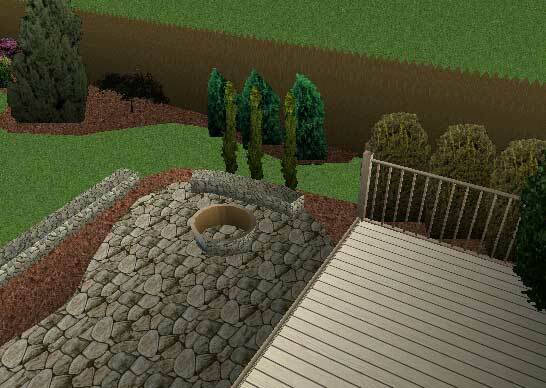 Using existing rock on the property build small garden walls, firepit, and install landscaping to clients needs below are beginnings of the client design..
appear. Talk to you soon. Designs are below the photos. 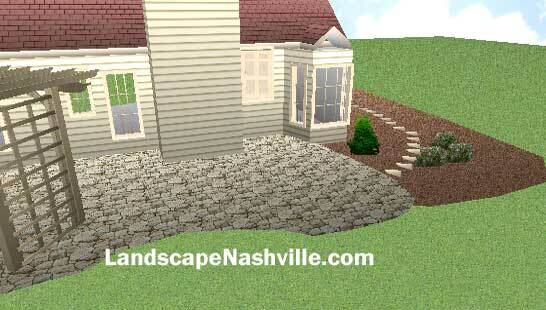 Click here for our Nashville Patios and Hardscapes Website. 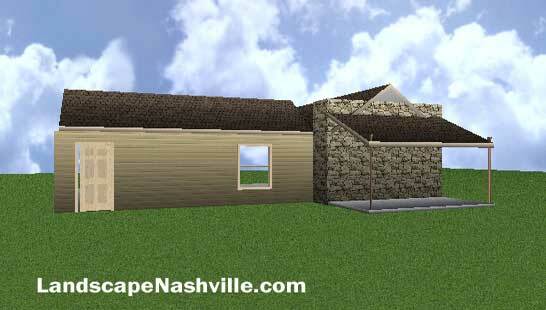 Spring Hill Tn Project Here. 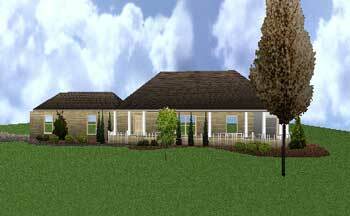 Hi Elizabeth I added some horsetail reed grass near the door. 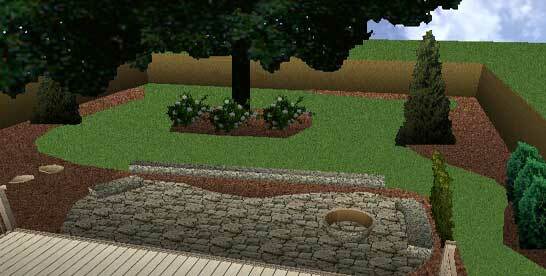 The small green mounds are a green type of sedum. 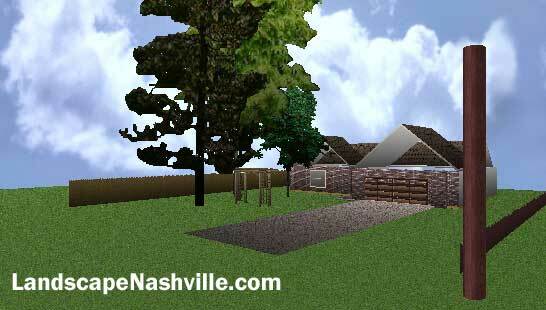 I added a Dogwood Tree and a Redbud Tree as well as a Dwarf Alberta Spruce, and a grouping of 3 Maiden Grasses. I will call you tomorrow. 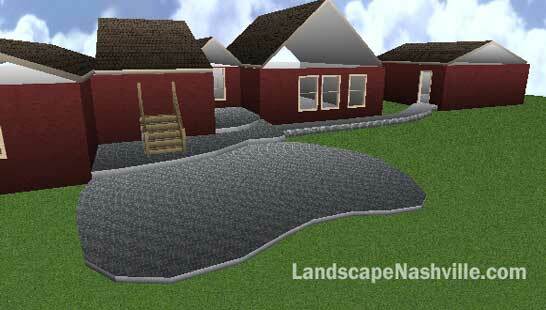 Currently working up estimate on hard surfaces and drainage along with landscaping for back yard. The Japanese name means ‘coral tower ’. 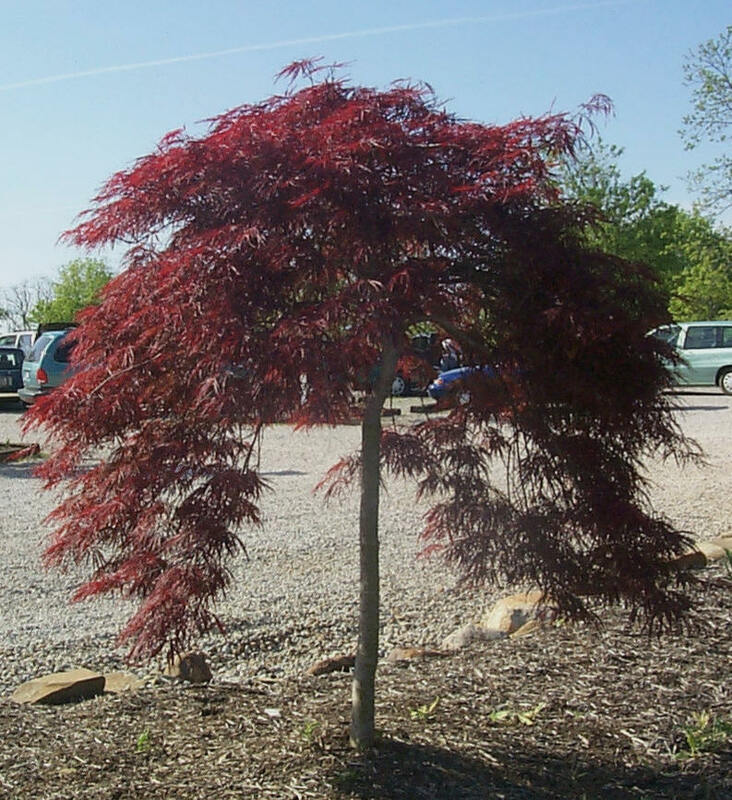 More commonly known as the Coral Bark Japanese Maple. Green laceleaf, threadleaf, or cutleaf weeping Japanese maple (Acer palmatum dissectum ‘Viridis’) matures to a naturally formal mounded cascading weeper. It can be pruned for a “mushroom cap” appearance, or left unpruned so that its branches weep clear to the ground. It reaches six feet in ten years. 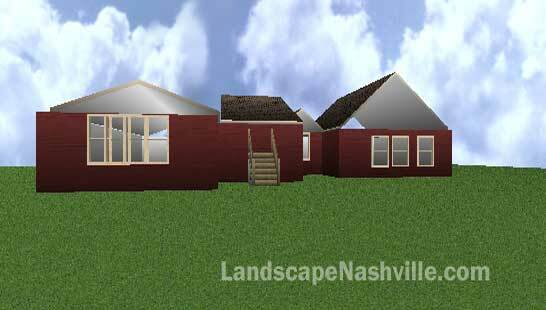 It can be trained via staking to be grow taller. 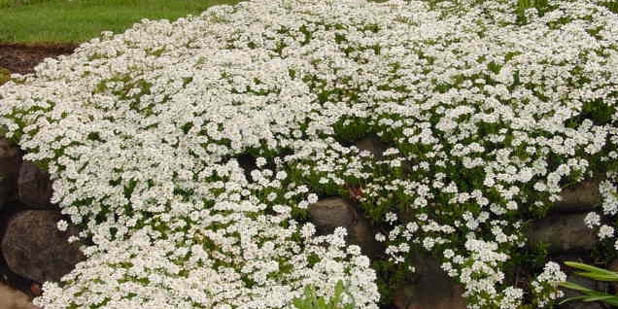 It will be much wider than it is tall, likely ten or twelve feet wide in ten years, though artful pruning year by year can limit its size, & it is even a popular bonzai item. 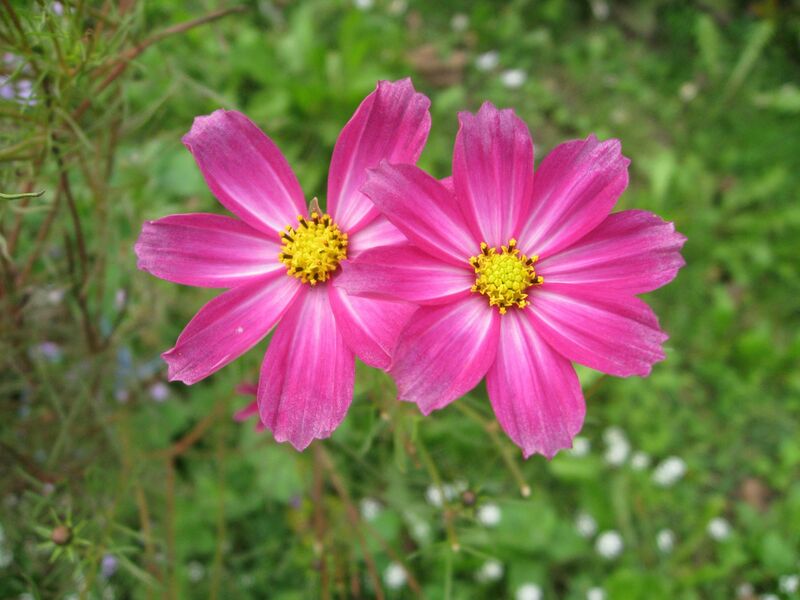 It likes moist well-draining soil, never too wet. It needs at least a little bit of afternoon shade or its delicately lacy leaves will be burned. 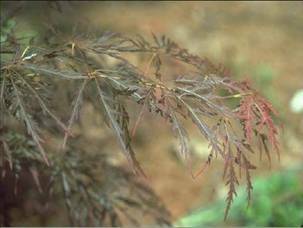 Varieties with wider leaf-types would be more apt to be tolerant of full sun, though young Japanese maples are in essence semi-shade trees, & laceleaf varieties tend to be overall more sun-sensitive. 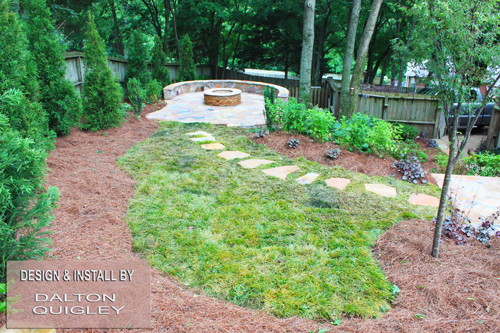 Mulching is useful to help keep the fibrous root system moist in summer. 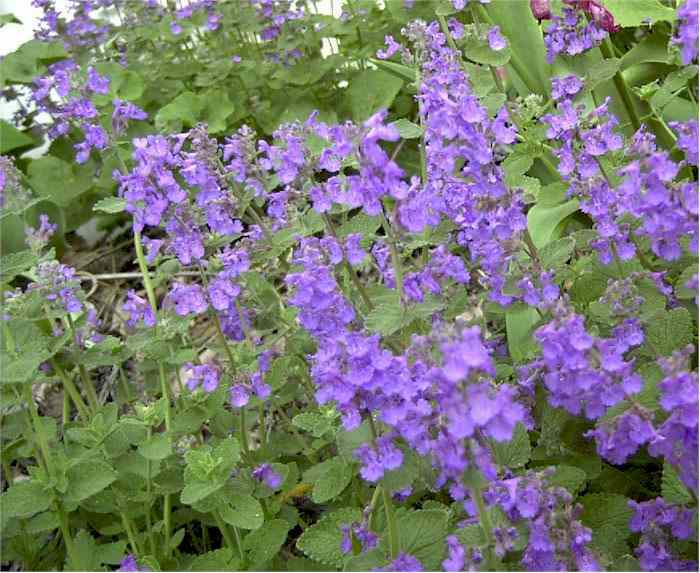 It can be grown in zones 6 through 8, but becomes delicate in zones with warmer summers. It has red-highlighted orange-gold autumn colors, holding its wondrously colorful leaves for several weeks before falling. These golden colors are very distinct from the autumn crimsons of purple-leaf maples, so ‘Viridis’ can be a marvelous contrast-companion with something like its red twin ‘Crimson Queen.’ Their leaves will provide startling contrasts spring through autumn. This information is from http://www.paghat.com/acerweepingviridis.html. 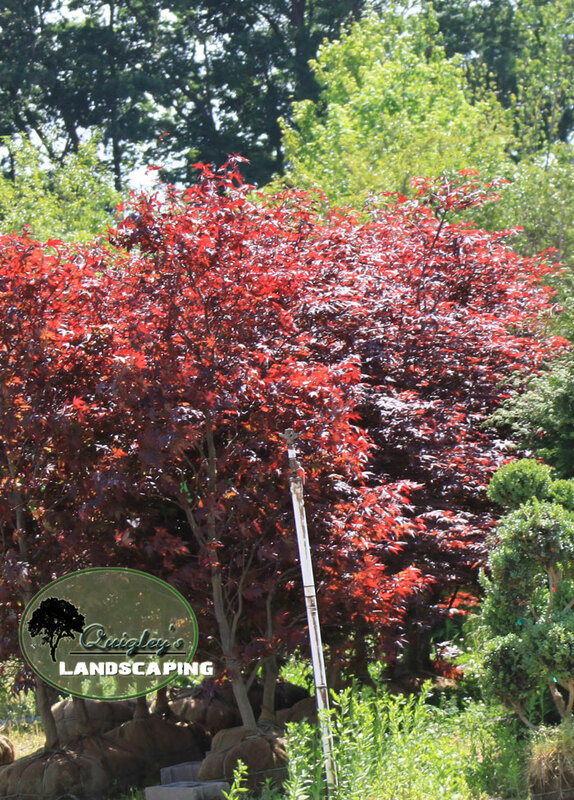 Call today for your Chrimson Queen Japanese Maple. 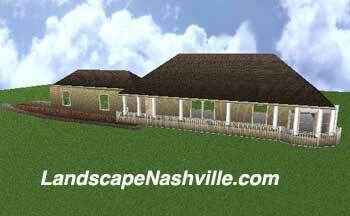 We will Buy, Deliver, and Install anywhere in the Middle Tn Nashville area. 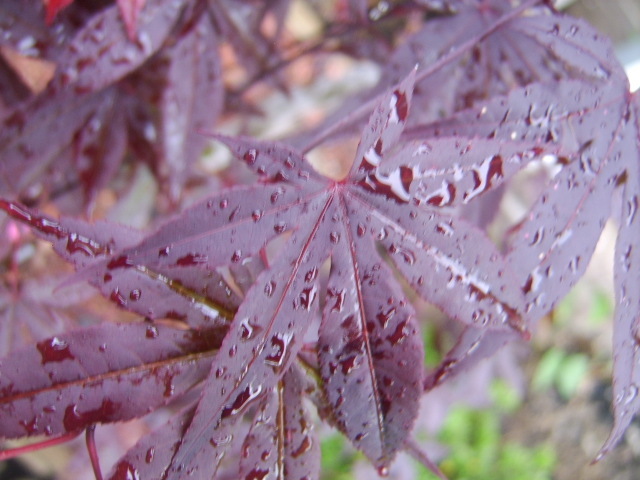 Buy a Bloodgood Japanese Maple Now! 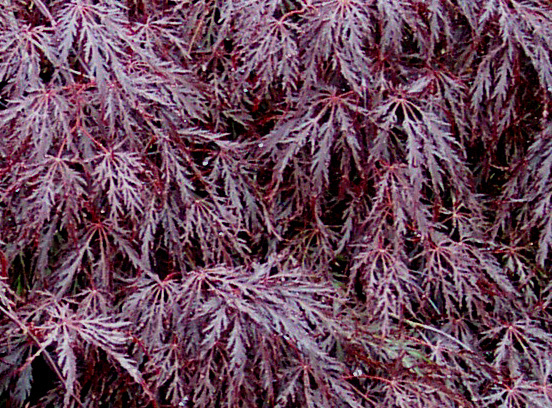 – Bloodgood Japanese Maple – 4-5 ft.
#5 Fireglow Japanese Maple has the Bloodgoods color during the Summer but in the Fall has this beautiful glowing color. 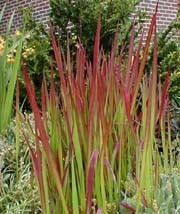 The Fireglow is a small tree with a graceful weeping habit. 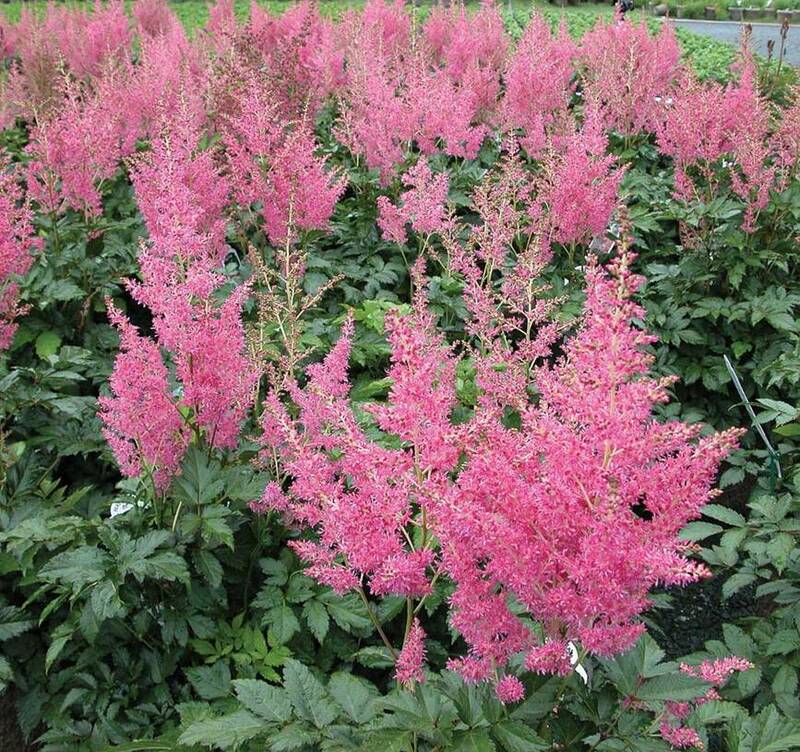 It is similar to the Bloodgood with a more vibrant color throughout the growing season. 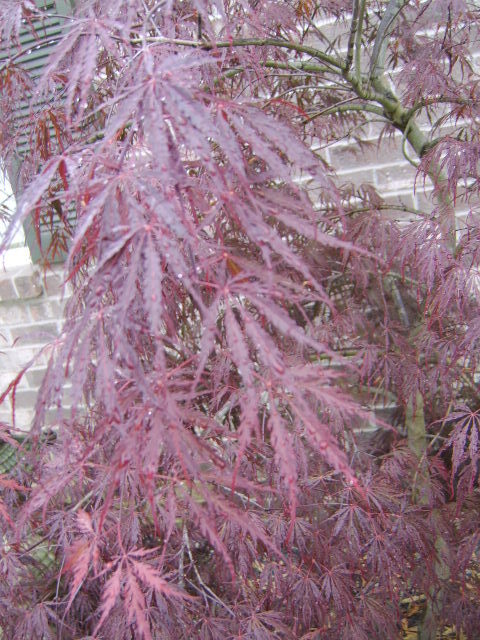 This maple does not revert to green foliage during the summer, but retains its awesome red coloration. The Fireglow has outstanding crimson fall color. 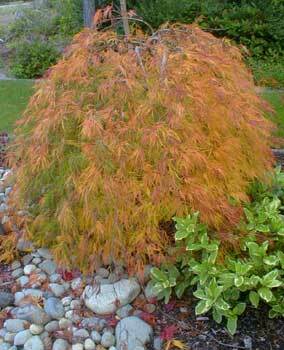 Call today for your Fireglow Japanese Maple. 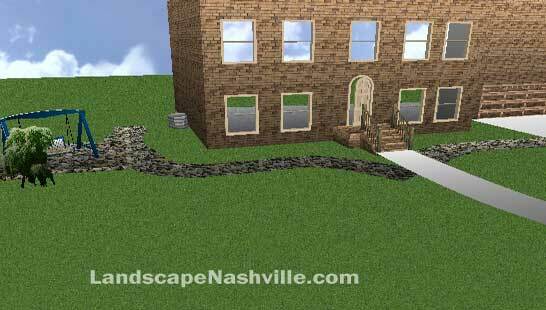 We will Buy, Deliver, and Install anywhere in the Middle Tn Nashville area. 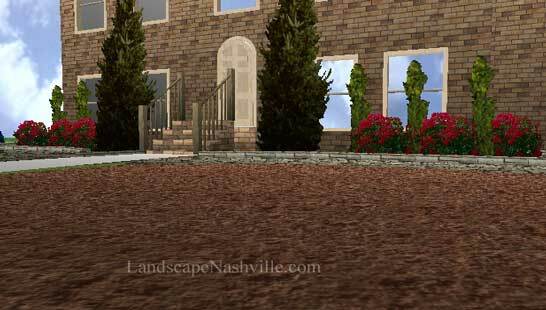 The Fireglow is maybe the best upright red maple for hot, humid areas. It will take full sun to part shade. 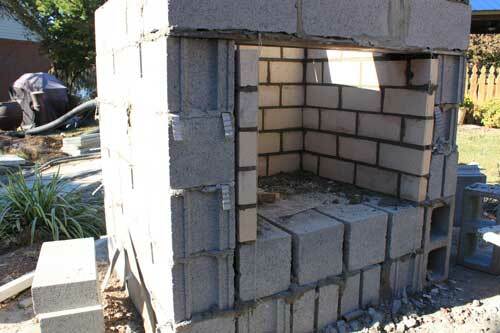 It will grow 8 to 10′ high. 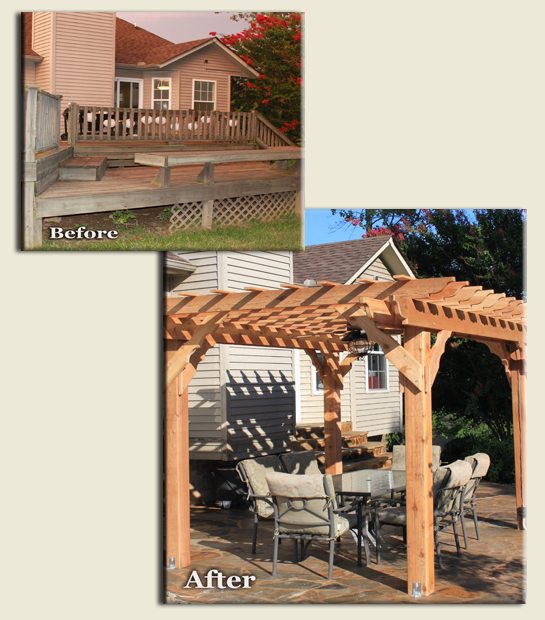 Get a Tamukeyama for your home – Tamukeyama Japanese Maple – 3-4 ft. 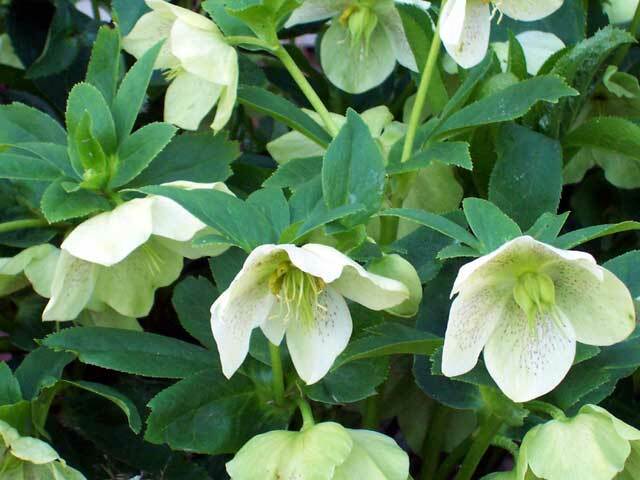 Selected for its upright, vase-shaped form; displays finely dissected rich green foliage. 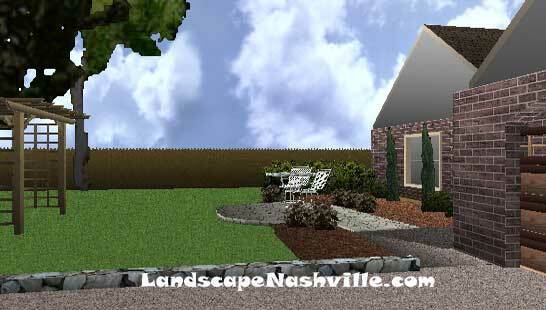 Excellent accent, wonderful focal point for the patio area. Fall foliage turns an interesting purple-brown. Deciduous. Full sun in cooler regions, filtered sun in other areas. Slow grower to 10 to 15 feet tall, 6 to 8 feet wide. Grafted. 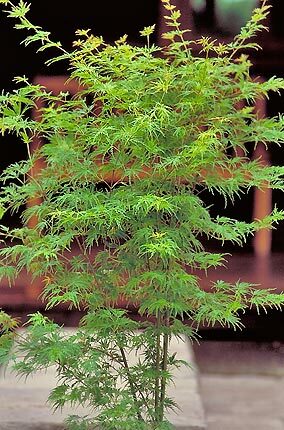 We can get this Japanese Maple in a 15 Gallon Container. 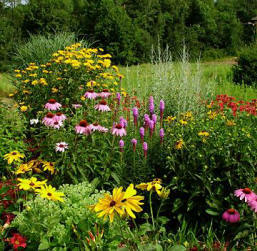 All of these plants are available to our landscaping clients. The Japanese name means ‘coral tower’. 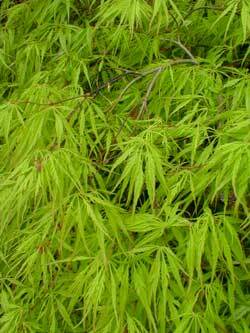 More commonly known as the Coral Bark Japanese Maple. 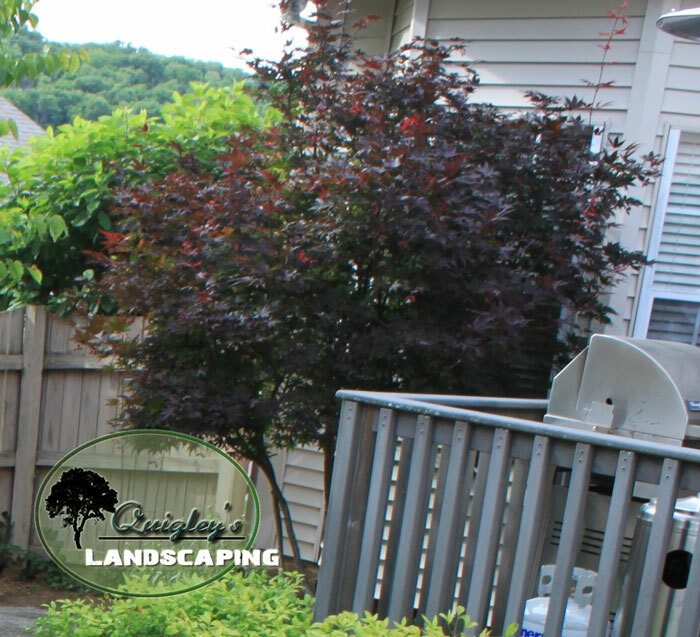 The Coral Bark Japanese Maple is deserving of much wider use. 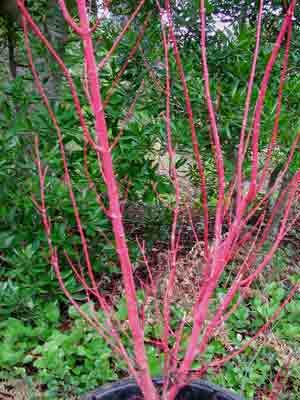 It has year round appeal, highlighted in winter when the stems and branches turn fluorescent coral in color. 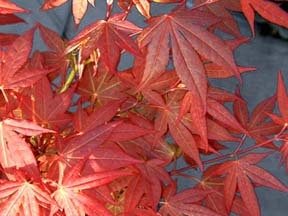 The new growth leaf color is a bright green and the fall color is a yellow-gold tinged with red. 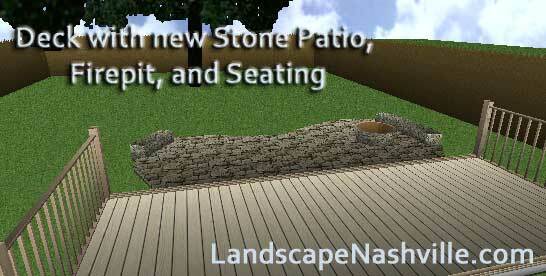 This information was from http://www.gardenheights.com/featuredjapanesemaples.html. It reaches six feet in ten years. 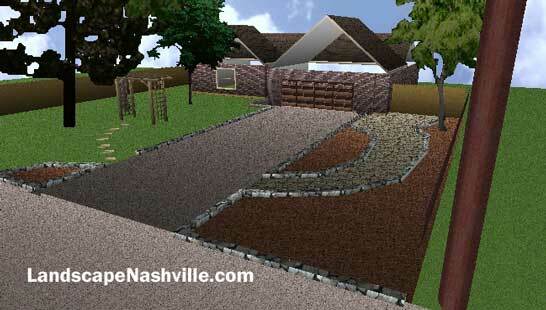 It can be trained via staking to be grow taller. It will be much wider than it is tall, likely ten or twelve feet wide in ten years, though artful pruning year by year can limit its size, & it is even a popular bonzai item. 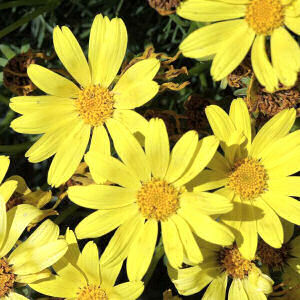 It likes moist well-draining soil, never too wet. It needs at least a little bit of afternoon shade or its delicately lacy leaves will be burned. 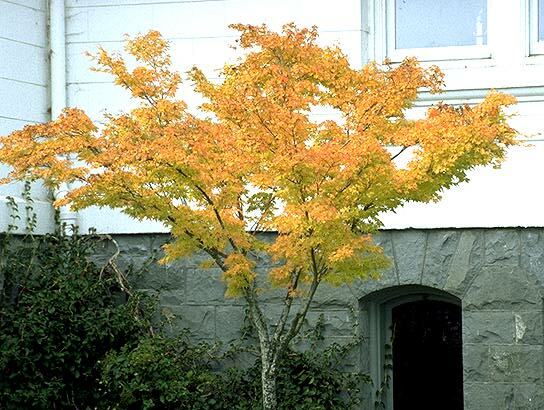 Varieties with wider leaf-types would be more apt to be tolerant of full sun, though young Japanese maples are in essence semi-shade trees, & laceleaf varieties tend to be overall more sun-sensitive. 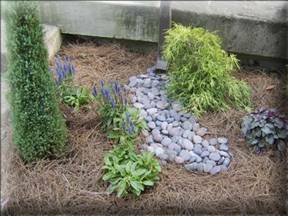 Mulching is useful to help keep the fibrous root system moist in summer. 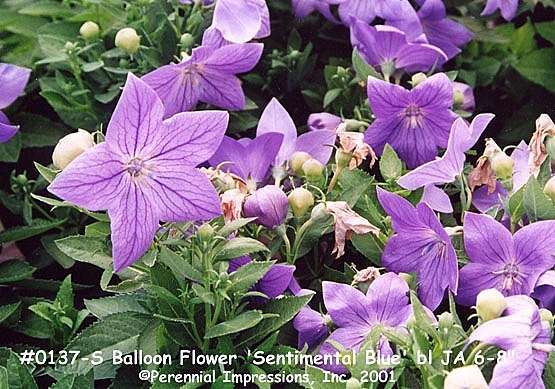 It can be grown in zones 6 through 8, but becomes delicate in zones with warmer summers. It has red-highlighted orange-gold autumn colors, holding its wondrously colorful leaves for several weeks before falling. align=”left” class=”style32″>These golden colors are very distinct from the autumn crimsons of purple-leaf maples, so ‘Viridis’ can be a marvelous contrast-companion with something like its red twin ‘Crimson Queen.’ Their leaves will provide startling contrasts spring through autumn. 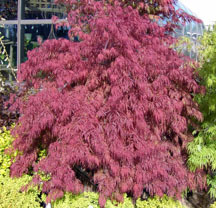 Attractive foliage with burgundy-red coloring turns brilliant scarlet in fall. Interesting blackish-red bark. 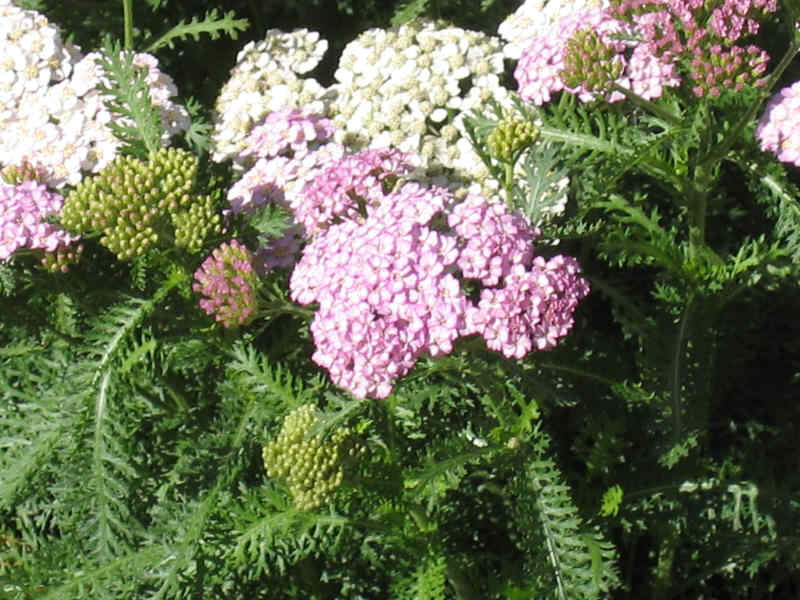 Slender, airy form well-suited for use as a small lawn tree or for patios and entryways. Deciduous. Filtered sun. Moderate grower to 15 feet tall and wide. Grafted. 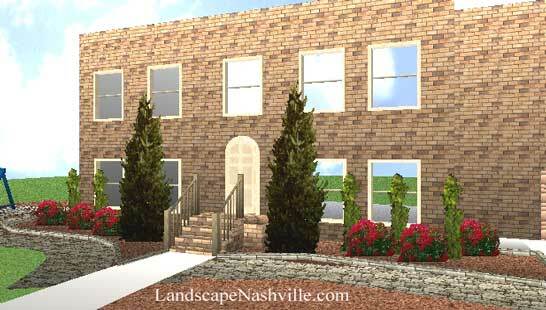 #5 Fireglow Japanese Maple is Available in Nashville.